The problem with opening a bottle of wine: inevitably, it will run out of wine. But to solve the world's foremost grape-related trouble, one winery in Italy has found the solution: a 24-hour, all-you-can-drink wine fountain that's completely free of charge. 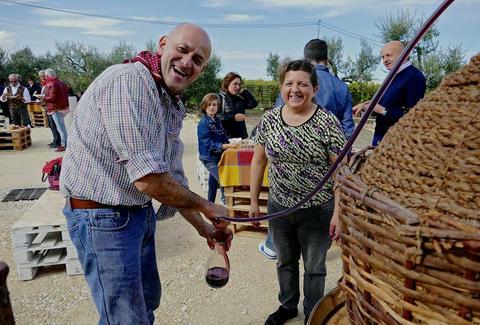 As announced on the Dora Sarchese winery Facebook page, the fountain -- Italy's first -- opened on October 9 in the town of Caldari di Ortona. Each year, pilgrims travel from Rome to Ortona to visit the remains of Saint Thomas at Ortona's cathedral. The newfound fountain of booze is meant to refresh pilgrims -- but doing so with a little more fanfare than the standard bubbler. Housed inside a giant barrel, the fontana del vino just looks cool, regardless of how good the wine is. But let's be real: this thing could be housed in the room from Saw and people would still frequent it. According to a separate Facebook post, the fountain opened to great fanfare, though the winery wants to let everyone know it's a place to stop and have a drink along the cammino, or just for lookers-on to explore out of curiosity -- NOT a place to just hang out and guzzle wine. Even so, there's really nothing to stop you. The idea for the fontana del vino was allegedly inspired by a similar fuente del vino in Spain, set in Irache along the Camino de Santiago, another, but more well-known pilgrimage. Now, though it looks like Italian wine lovers will have a pilgrimage to make all of their own.